Neil Jones Food Company is a family-owned business with a tradition of providing healthy, fresh-packed products since 1915—but there was a snag. Neil Jones’s image, while traditional and well established, was also stale and didn’t reflect the company’s fresh thinking and avant-garde approach to packaging. Gravitate was hired to create an ongoing print and interactive campaign to communicate the company’s history and innovation and to firmly reinforce Neil Jones as an industry leader. Our strategy process revealed some design elements the client would like to influence its new image as well as specific components it wishes to retain from its current campaigns. Armed with this knowledge and a firm grasp of its competition and target audiences, we go to work creating moodboards (not specific design elements but rather visual indicators of the site’s tone and feel). The chosen moodboard highlights the short trip “from farm to package” using tight shots of the product against the rich, warm textures of wood grain and open fields. Before jumping in and creating the website and marketing materials, we needed to completely overhaul Neil Jones’s image. Using what we’ve learned throughout the strategy/moodboard process along with establishing buying personas and target audiences, we went through our collaborative process of designing a new logo and brand delivery system. 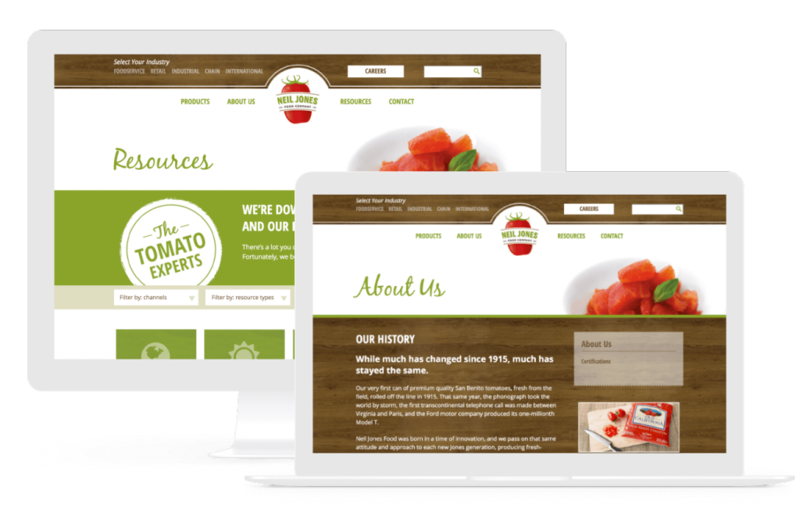 This new identity fosters brand consistency and recognition and directly influencing all future design and functionality decisions made throughout the website and print collateral. 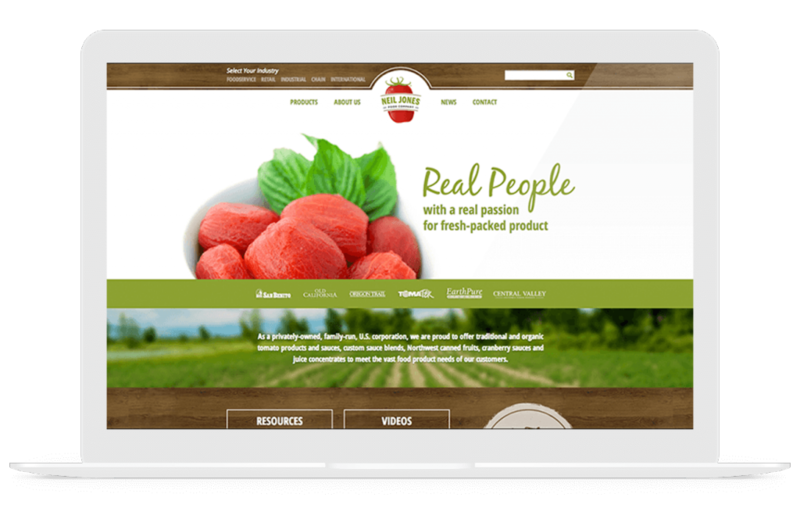 Neil Jones Food Company’s content and messaging required an update to go along with its design facelift and new, forward-thinking attitude. Our copywriters conducted extensive research into the client, its products, target audiences, and the competition to develop messaging architecture and to deliver concise, compelling copy for the website, landing pages, and numerous ongoing print advertising campaigns. 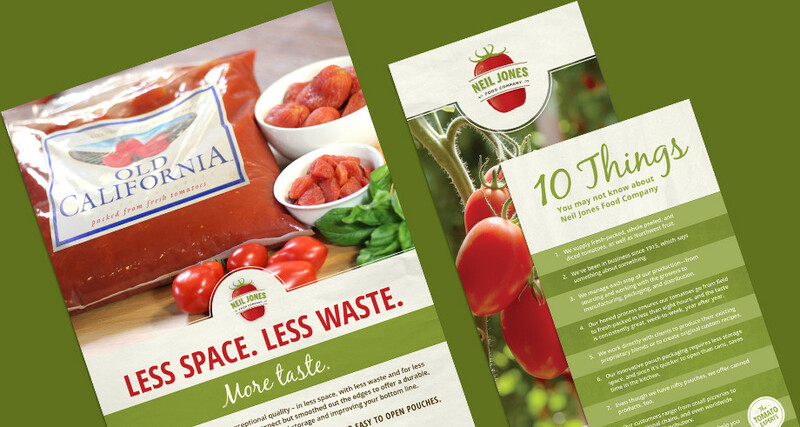 Neil Jones markets its products primarily to vendors, restaurant brokers, and distributers—and more often than not, those audiences are reached through print advertising in magazines, sales sheets, and leave-behind material. Gravitate continually creates, updates, tests, and refines Neil Jones’s alluring print collateral—routinely attracting new warm leads and leaving competitors scrambling to keep up. 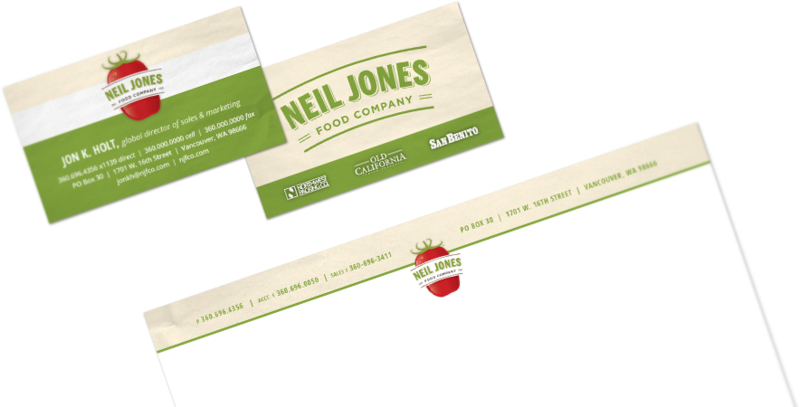 The new website and ongoing collateral produced for Neil Jones Food Company firmly reinforces it as the industry leader. From the custom in-house photography that artfully highlights the freshness of the products and the practical appeal of the company’s packaging to the vibrant and warm take-away materials, our work captures the company’s sophistication while paying homage to the rich tradition behind its story.